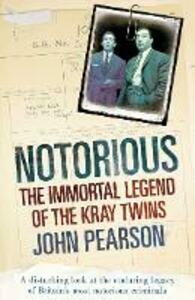 Ever since the Kray twins invited John Pearson to write their 'official' biography more than forty years ago, he has been obsessed with them. After they were jailed in 1969 for thirty years for murder, Pearson's biography The Profession of Violence enjoyed a cult following among the young and was said to be the most popular book in H.M.'s prisons, after the Bible. Ron died in 1995. Reg followed him five years later, and both of their funerals drew crowds on a scale unknown for film stars, let alone for two departed murderers. Since then, far from fading with their death, public fascination with the twins has never flagged. Their clothes and memorabilia are sold at auction like religious relics. Ron's childlike prison paintings fetch more money than those of many well-known artists. And people still refer to them like popular celebrities. Why? This is the question Pearson asked himself, and over the past three years he has been re-examining their history, unearthing much previously unknown material, and has come to some fascinating conclusions. Notorious reveals new facts about the Krays' tortured relationship as identical twins; a relationship which helped predestine them to a life of crime; a relationship that made them utterly unlike any other major criminals. Pearson has discovered two new and unsuspected murders, along with fresh light on the killings of George Cornell and Jack 'the Hat' McVitie. There are facts about the twins' obsession with publicity, and how far this made them 'actor criminals' murdering for notoriety. Most riveting of all are the chapters which reveal how Ron Kray caused a major sexual scandal in which a prime minister, together with other leading politicians, condoned the most outrageous establishment cover-up in British politics since the war. Notorious contains many more surprises, but the one thing that emerges is that the Kray twins were not only stranger but also far more important than anyone ever suspected. Fascination with them will forever remain; they will never lose their role as the immortal murderers.